We’ve all been there. Perusing the wine aisle in a supermarket, bewildered, is one of the great challenges of Friday evenings the world over. But luckily, for those in need of a helping hand, Domingo Cruzat has the answer. Before he chose to pursue an MBA at HEC Paris he launched his own company, HelloWine, in his native Chile—the company taps into a market of consumers seeking a deeper understanding of the wine industry, by offering members a subscription box of four small wine bottles, sourced from wine merchants across the country. Why though, if Domingo was already a successful entrepreneur, would he decide to enroll in an MBA program on the other side of the world? Domingo had the chance to hand over the mantle of his company and pursue an MBA—the CEO he hired is an MBA graduate! Returning to school was in the pipeline for Domingo for a long time. He was attracted to the idea of taking time away from the wine industry to learn about a different culture, and that is something he has been able to immerse himself in during his time in France. He, his wife and children have been reveling in the galleries, theatre and the French way of life. As well as a broadened cultural understanding, he has sought out the knowledge that would fill the gaps in his business acumen—during the HEC Paris MBA students receive a holistic business education in modules ranging from Financial Markets to Organizational Behavior, and the increasingly important Ethics and Sustainability. That change involves happily taking a step back and overseeing HelloWine from the position of majority shareholder. The HEC Paris MBA—ranked the number one MBA program in Europe by The Economist—is allowing Domingo to pursue what he believes is the true meaning behind being an entrepreneur. “I don’t believe the trend that describes entrepreneurs as heroes, as cool people who have free time and can manage their agendas how they want,” he explains. When he graduates, Domingo wants to return to Chile, and do exactly that—“what is attractive for me is that any innovation or change you are a part of will benefit a lot of people,” he says. His mindset has changed from his entrepreneurial days, as he admits to being open to switching careers to the corporate space, acting more as an intrapreneur to help an existing company innovate from within. innovators to harness that disruption is, falls heavily on business school faculty—indeed, one of the reasons Domingo opted for HEC Paris is because he knew he was going to learn from experts that were playing important roles in their industries. He chose to study the marketing specialization on the MBA—HEC Paris also offers specializations in entrepreneurship, finance, strategy, and advanced management—to tap into that. 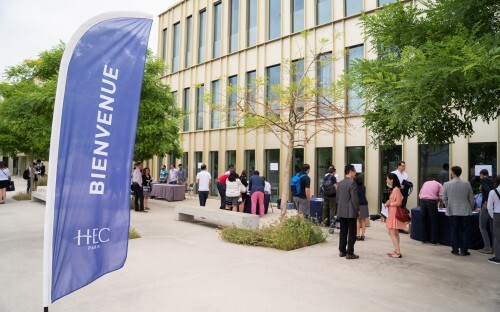 Citing classes by marketing professors such as Frederic Dalsace, Anne Michaut-Denizeau, and Anne-Laure Sellier, he adds that HEC Paris’s location “in one of the major marketing capitals” in the world swayed him to choose the marketing specialization as part of his MBA. Being armed with that knowledge is only half the battle though, as Domingo is well aware of the personal determination that has to accompany his MBA education at HEC Paris. “Even though HEC Paris provides all the resources to get a job,” he says, “in the end it all depends on you.